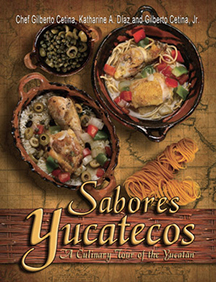 Home/Comida/Sabores Yucatecos: A Culinary Tour of The Yucatán by Gilberto Cetina, Katherine A. Diaz, & Gilberto Cetina, Jr.
All of the focus in Sabores Yucatecos: A Culinary Tour of the Yucatán is on the foods of Mexico’s Yucatán Peninsula. This region of Mexico offers foods with an allure that matches the mystique of the ancient Maya. The foods are rich in history and tradition. Novice or experienced cooks will be fascinated by what they discover about the Yucatán region, its culture and the stories behind its cuisine. This book delivers the tastes of the Yucatán. The book’s guide is Chef Gilberto Cetina (center, in photo), who learned the culinary secrets of his mother as a young boy and brought them to his restaurant in Los Angeles—Chichén Itzá Restaurant—that specializes in Yucatecan cuisine. Food writer, Katharine A. Díaz (left, in photo), interprets Cetina’s delicacies step-by-step for the home cook. She has written about Latino cuisine for many national publications as well as for the Encyclopedia Latina (Scholastic Library Publishing). Gilberto Cetina, Jr. (right, in photo), also contributed his many culinary talents and expert eye to the book. 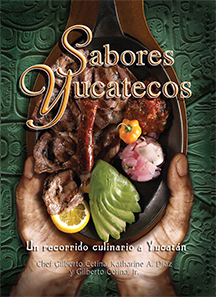 4 reviews for Sabores Yucatecos: A Culinary Tour of The Yucatán by Gilberto Cetina, Katherine A. Diaz, & Gilberto Cetina, Jr.
“ . . . the restaurant that keeps bringing me back to Mercado La Paloma is Chichén Itzá, which is probably the most serious Yucatecan restaurant in town . . . Its menu a living thesaurus of the panuchos and codzitos, poc chuc and papadzules, banana-leaf tamales and shark casseroles that make up one of Mexico’s most thrilling cuisines. traditional Yucatán dishes as well as inspired dishes. plátanos con crema, or choose from a variety of regional tamales.